OTTAWA, ONTARIO, December 14, 2017 – GaN Systems, the global leader of GaN (gallium nitride) power semiconductors, announced the launch and availability of its Insulated Metal Substrate (IMS) Evaluation Platform, which provides a flexible, low cost, high power development platform for high-efficiency power systems with 3kW or higher applications. 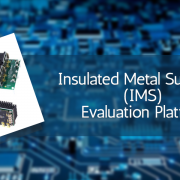 The IMS Evaluation Platform, in combination with GaNPX packaging technology and smart design techniques, enables power engineers to quickly take full advantage of GaN power transistors in designing smaller, lighter, lower cost, and more efficient power systems for data center, automotive, and energy storage system applications. This evaluation platform consists of a motherboard (GSP65MB-EVB) and two IMS evaluation modules in half bridge and full bridge variants. The modules can be configured as a half-bridge (single IMS module) or a full bridge (two IMS modules) on the high-power motherboard. IMS evaluation modules are available in two power levels: 3kW (GSP65R25HB-EVB) and 6kW (GSP65R13HB-EVB). The IMS evaluation module includes GaN E-HEMTs, gate drivers, isolated DC/DC supply, DC bus decoupling capacitors, and a heatsink to form a fully functional half bridge power stage. Low Thermal Resistance & Optimized Layout: The IMS platform enhances the thermal and electrical performance benefits of GaNPX® E-HEMTs. The drive board is tightly coupled with the IMS board to minimize power commutation and gate driver loops to optimize performance. More Flexibility: The platform is very flexible, enabling twelve different configurations, architectures, and operating modes. 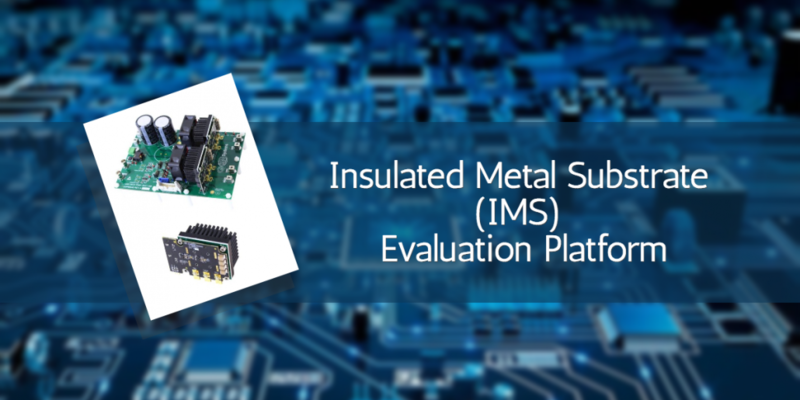 IMS evaluation modules can be used independently as a high-power GaN intelligent power module with developers’ own system boards for in-system prototyping. Greater Power Density: Using IMS boards for transistor mounting takes advantage of the vertical space available in larger power applications. The optimized driver board not only minimizes both power and gate driver loops, it also increases the power density of the electronics. Please visit www.gansystems.com for more information and at major distributors such as Mouser Electronics Richardson RFPD. GaN Systems is the global leader in GaN power semiconductors with the largest portfolio of transistors that uniquely address the needs of today’s most demanding industries including data center servers, renewable energy systems, automotive, industrial motors and consumer electronics. As a market-leading innovator, GaN Systems makes possible the design of smaller, lower cost, more efficient power systems. The company’s award-winning products provide system design opportunities free from the limitations of yesterday’s silicon. By changing the rules of transistor performance, GaN Systems is enabling power conversion companies to revolutionize their industries and transform the world. For more information, please visit: www.gansystems.com or on Facebook, Twitter and LinkedIn.